I pretty much love all nuts and seeds, and walnuts are no exception. They’re awesome to have on hand as a crunchy, good-for-ya snack. My personal favorite way to use walnuts is by making walnut milk. I simply blend 1 cup of walnuts (soaked overnight) with 4 cups of water and a pinch of salt for 45 seconds. I find the walnuts become so smooth and creamy that I don’t need to strain the milk! Then I use it in smoothies and mix it with chia seeds to make chia pudding that packs a serious health punch. Walnuts are one of the best plant sources of omega-3 fatty acids, which are anti-inflammatory and may help prevent heart disease. Just one 1-ounce serving of walnuts provides twice the recommended daily intake. They’re good for your gut! 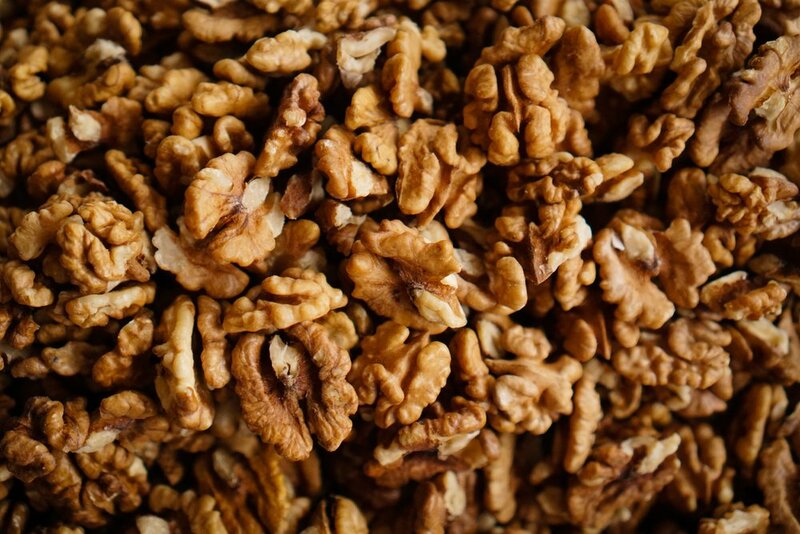 Walnuts help promote the good bacteria in your gut and help your gut produce more butyrate, a short-chain fatty acid (SCFA) that supports gut health and fights inflammation. Walnuts help control appetite and hunger, making them great for anyone trying to lose weight. Walnuts may help with blood sugar control, making them protective against type 2 diabetes and helpful for anyone trying to manage their diabetes through food and lifestyle (which, ahem, you should be). Walnuts and other nuts are a staple in the Mediterranean Diet, which supports a healthy heart. And last but not least, walnuts are great for your brain (which they just so happen to resemble). They help protect your brain from damaging inflammation and may even support processing speed and memory. I have to admit I also love walnuts because they’re one of the less expensive nuts out there. I get mine from Costco and that big bag will last me a long time. After what always seems to always feel like a long winter, Spring is finally here! The days are longer, lighter and warmer. It’s the season of rebirth, renewal, new beginnings and growth. We’ve been hibernating all winter - sleeping more, staying inside, resting. Now, much like the flowers, we’re germinating, budding, and getting ready to burst forth into our lives. In Spring, our main goal is to help balance this Kapha energy. In general, we want to incorporate foods and practices that support a feeling of lightness, dryness and heat. Please also take your own dosha into consideration and adjust these recommendations accordingly. You may notice your preference for heavier foods that felt nourishing throughout the winter is starting to diminish and you’re naturally feeling more inclined towards lighter foods, fruit, fresh vegetables and salads. This is totally in line with the shift from winter to spring! During the winter, all that heavy food has accumulated energetically (and maybe physically) in our bodies. Now is the time to support digestion and detoxification. Focus on pungent and bitter foods to support the flow of bile and the detox process. Bitter greens are especially wonderful for this (and also happen to be what’s growing right now) - dandelion greens, kale, cabbage, radicchio, watercress, etc. Favor fresh vegetables. They don’t necessarily need to be raw, but perhaps instead of a stew or long roasting time, try steaming them or quickly sautéing them. Green juice is a great way to get lots of nutrients and support the liver. Reduce heavy, oily and fried foods. Use less oil in your cooking. You can always use water to help prevent sticking in pans. Reduce your consumption of dairy products, which can promote mucus and congestion in the body. You may also wanted to reduce your consumption of animal products, again in favor of lots of fresh vegetables and fruit! If you’re into doing cleanses, spring is a great time to do them! Lots of fresh green juices and light, easy-to-digest meals would make an appropriate cleanse. Kitchari is a staple in Ayurvedic tradition - it’s a super nourishing, simple dish that is used for cleansing, for any kind of digestive issue and as a staple meal. I would recommend adding some fresh herbs like parsley or cilantro this time of year. All spices will be generally supportive during Spring. Spring cleaning is a thing for a reason. I think we’re all naturally inclined to clear the debris of the winter and mentally prepare ourselves for a fresh start. Take some time to clean up your living space, go through your closet and organize your kitchen. Use Marie Kondo as inspiration! Now is also the time to reconnect and rekindle relationships that may have taken a backseat over the last few months. Increase your socializing time, spend time with friends and family. The dark, introverted season is over and this reconnection will invigorate you. This is also a good season to play and connect with your inner child. Do whatever it is that sparks joy for you and makes you feel playful - maybe it’s mini golf or having a silly workout outside with a friend. Maybe it’s wandering through a museum or park. Whatever lights YOU up inside! Oil massage is a big thing in Ayurveda. If you’re into this, spring is the time to use sesame oil. Give yourself a nice oil massage, starting at the ends of the limbs and working your way towards your heart. Do this before a shower. In terms of exercise, now is the time to amp your routine back up. Winter may have left you feeling low energy and lethargic, and now is the time to take your energy back. You might feel inspired to do more high intensity classes, jog, hike or bike. You might also shift your yoga practice to something with more movement. This time of year, exercise is best done in the morning between 6 and 10 am. If your schedule doesn’t allow, then the evening still works. Try rising a little earlier. Being up by 6 this time of year is ideal. What are some of your favorite ways to prepare your body and your mind for Spring?! Let me know below! Ayurveda is the traditional holistic healing system of India. It is one of the three oldest surviving comprehensive herbal medicine systems. The focus of Ayurvedic medicine is prevention, balance, healing and nourishment through food and herbs. Ayurveda was developed over centuries of patient observation and experimentation - before chemistry or microscopes, which is pretty amazing! Ayurveda focuses on longevity and good health. It incorporates diet, exercise, activities, routines, massage and botanical medicine. First let’s get acquainted with the five elements - earth, water, fire, air, ether (space). These elements inform how Ayurveda describes certain energies - grounding, cooling, warming, moistening, drying, etc. All these elements are present in the body at all times, just in different and varying amounts. Elements can be affected by our environment, diet, exercise, and even our emotional state. Vata - the air type. They tend to be creative, nervous, restless or spacey. Their body type tends to be thin, willowy and fragile. Pitta - the fire type. Pittas tend to be fiery, passionate, colorful, argumentative, competitive, leaders, decisive, convincing. They typically have a normal build, they can be thin and have good muscle definition. Kapha - the earth type. They’re considered grounded, conservative, loyal, slow, calm and steady. They tend to be a bigger build and can put on weight easily. Some people are just one dosha, lots of people are a mix of two. Some people are tri-doshic, meaning they have a good balance of all three doshas, but most of us have a dominant dosha. We are all born under a certain dosha - with certain dominating tendencies, but our dosha can change over our lifetime if we acquire certain imbalances. For example, I’m a Kapha-Pitta but that doesn’t mean that I won’t have a Vata imbalance at some point. In this case, I would first be treated for my Vata imbalance. Ayurvedic practitioners take both of these doshas (your main one and your present imbalance) into account. There is a huge focus on the gut and digestion in Ayurveda. In Ayurveda, digestion is thought of as a fire that needs to be continually stoked. Too many cold, damp or raw foods can make digestion challenging - which is why there’s a big focus on cooked foods and room temperature or warm beverages/foods. We want to keep the fire stoked. We’re only as good as what we can digest. This is in line with the functional and holistic perspectives in medicine that are becoming more and more prevalent in our culture’s approach to health. Each season also has a dosha assigned to it - summer is Pitta (heat), fall is Vata (cold, dry), winter can be both Vata and Kapha (wet, heavy) and spring is Kapha (damp). Of course, this can vary depending on where exactly you live. Here’s a good Dosha Quiz if you don’t know what yours is. I would recommend Googling “dosha quiz” and taking a few others to compare. Food is commonly used to help balance the doshas. By eating for your type and taking into account the season you’re in, you can tailor and shift your diet to support optimal balance. There are other lifestyle practices that can help you align with the energy of the season. For example, most of us naturally experience a slowing down and turning inward in the fall and winter, as the days get shorter and darker. You may sleep more, dial down intense exercise and spend more time nesting and reflecting. In the summer, the days are longer and you likely feel more energized. The energy is expansive - you might be spending more time being social and going to events. We have a natural inclination to seasonal foods, too. In the summer you probably eat lighter, eat more raw and cooling foods. In the winter you probably tend toward cooked foods, warm foods, soups, stews and warming spices (and yes, pumpkin spice lattes count). By taking your own personal dosha into account, you can eat in such a way and incorporate lifestyle practices that supports balanced energies and health. For example, if you’re a Pitta and it’s summer you’ll want to focus on cooling foods like coconut water and cucumber. If you’re a Kapha and it’s winter/spring you’ll want to focus on warming and drying foods to help balance the dampness of Kapha. This is the basic framework of Ayurveda! Once you know your dosha, you can start looking into specific foods, herbs and lifestyle practices that will help you stay balanced. It’s a totally different way of thinking and describing foods and practices, but by continuing to read and research on it, the vocabulary will come more naturally to you. I’ll be continuing to add articles with more specific recommendations and focus on foods for the three doshas. Stay tuned! Any questions? Please leave them below! Good Medicine Nutrition! My name is Emily. I am a Holistic Nutritionist & Health Coach. I believe food is the ultimate healer - for body, mind & spirit. This is the space where I share my favorite recipes, essential knowledge for health & other practical lifestyle tips to empower you to take ownership over your well-being.